Government experts in the UK have set targets for the food industry to cut the amount of calories in its produce, in an attempt to tackle obesity. Health officials in the UK are asking the food industry to cut the calories in its products in an attempt to reduce the rate of obesity in the UK. 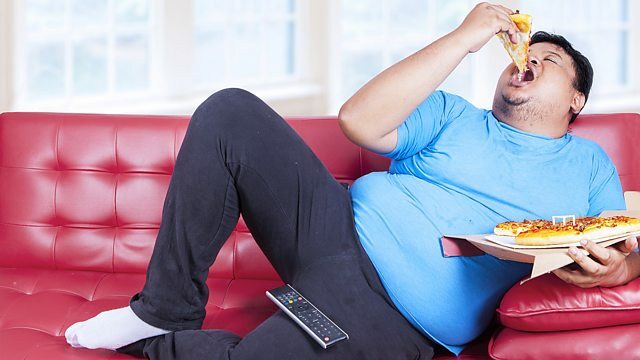 Top health officials say that Britain is too fat and needs to lose weight. Which of these phrases does NOT refer to the aim of most dieters? The correct word begins with 'o'. 'Creep' refers to slow, gradual movement or growth. Which of these words is NOT a synonym for 'creep'? Dan said his father cleans the house - can you remember his words? Which sentence pattern can we use to describe an organised attempt to achieve something? 'bulk out' means 'get bigger and heavier'. 'Slim down' and 'shed weight' both refer to weight loss, which is the aim of most dieters. We hope you enjoyed this episode of News Review. You can find more episodes here.